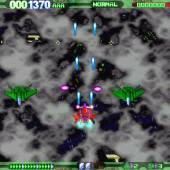 Creature Jungle 16 is an excellent freeware top-down shoot 'em up (affectionately known as "SHMUPS" by fans) game from Japanese designer Takeuchi Kouta. The game's objective is the same as ever: shoot everything and anything that moves. Creature Jungle 16 continues the excellence of Japan's freeware SHMUPS community: the game is good-looking, the animations are smooth, and the action fast and furious. I find the game a bit too difficult, what with so many weapon effects and fireworks flying around the screen at once. SHMUPS fans will probably find the game challenging and fun, though, and the great graphics are hypnotic enough to glue you to the screen for hours on end. Two thumbs up for another excellent freeware underdog!